Occasionally, high levels of certain chemicals in the urine form into crystals. Eventually these crystals become large enough to form stones in the kidney, a condition called nephrolithiasis. Stones (calculi) may also form or be found in the ureter or the bladder. Combinations of minerals and other chemicals make up the salts in these stones. 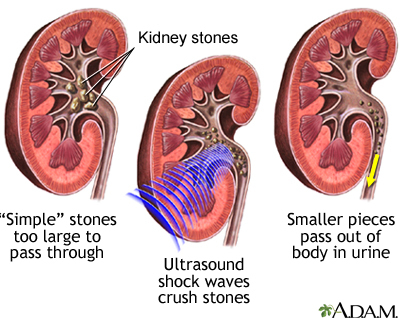 The key process in the development of kidney stones is supersaturation. Deficiencies in Oxalobacter formigenes, an intestinal bacteria that breaks down oxalate. Hyperparathyroidism. Overactive parathyroid glands cause about 5% of calcium stones. People with this disorder have at least a 20% chance of developing kidney stones. Women are more likely to have this disorder than men. Immobilization. Lack of movement can lead to kidney stones. Renal tubular acidosis. This disorder causes an acid and alkaline imbalance. Renal tubular acidosis not only increases calcium levels in the bloodstream, but it also reduces protective citrate levels. Human body tissues, and certain foods, contain compounds called purines. Purine-containing foods include dried beans, peas, and liver. When the body breaks down purines, it produces uric acid. The presence of a certain level of uric acid in the body is normal, but excess uric acid can lead to stones. Note: Hyperuricosuria can also trigger calcium stones. Therefore, people with hyperuricosuria may have a combination of calcium and uric acid stones. Gout. Uric acid and other kidney stones develop in up to 25% of people with primary gout, a painful form of arthritis that occurs when uric acid in the blood forms crystals in one or more joints. Diabetes. 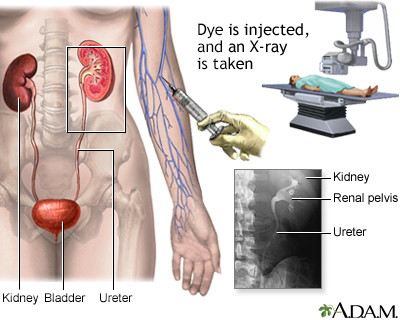 People with type 2 diabetes have highly acidic urine that can lead to kidney stones, particularly uric acid stones. Insulin resistance. People with insulin resistance have an increased risk for uric acid stones. 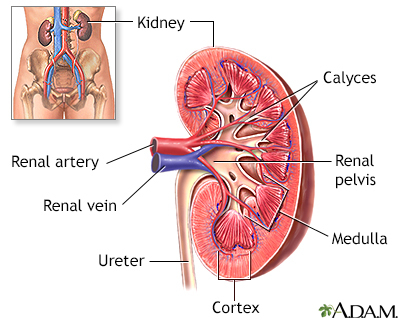 The reason is unknown, but it may be related to the transport of certain salts through the kidneys. This transport changes in people with insulin resistance. Kidney abnormalities. Kidney problems that reduce the production of ammonia, particularly in people with diabetes or insulin resistance, may lead to the formation of uric acid stones. Genetic factors. Inherited factors can increase a person's risk for uric acid stones. Hypocitraturia. Hypocitraturia is a low amount of citrate in the urine. Diet. Eating too much animal protein increases the risk of forming uric acid stones. Struvite stones are almost always caused by urinary tract infections. Certain bacteria produce urease, which breaks down urate and raises the concentration of ammonia in the urine. Ammonia makes up the crystals that form struvite stones. The bacteria that promote stone formation are most often Proteus, but they may also include Ureaplasma urealyticum, as well as Pseudomonas, Klebsiella, Providencia, Serratia, and Staphylococcus species. Women are twice as likely to have struvite stones as men. A type of medicine, which has other uses, may help smaller stones pass. These drugs are called Alpha-blockers and they help relax smooth muscles in the ureter and bladder, thus potentially helping a stone move. Grapefruit Juice. Several studies have found that drinking grapefruit juice might increase the risk for stones. Soft Drinks. People with kidney stones should avoid cola drinks that contain phosphoric acid, because they can severely reduce citrate levels in the urine. However, citrus-based sodas (such as 7 Up and Sprite) are high in citrate, which might help prevent stones from forming, particularly in people with low citrate in their urine, or who have a tendency to form uric acid stones. Alcohol. Wine may protect against kidney stones. However, it is important to remember that beer and other alcoholic beverages also contain purines, which may increase the risk for the less common uric acid stones in susceptible people. Binge drinking increases uric acid and the risk for stones. Coffee and Tea. Some research has reported a lower risk for stones in people who drink tea and both regular and decaffeinated coffee.